Landscaping often comes with a few out-of-pocket costs. A well-manicured garden however, speaks for itself. It can do more than just recoup your investment. But with any investment, you need to be smart about how you’re spending your money. Here’s a look at how you could be stretching your dollar out to help you get that picture-perfect garden. Local plant-life will grow much better than non-natives. Local plants need less care and attention once planted and are usually cheaper to buy. Buying local also gives you a chance to develop good relationships with local suppliers. These suppliers can provide you with expert local knowledge, particularly around what types of plants will grow best. Plus, local suppliers are much more likely to give discretionary discounts to clients. Recycled timber and brick are just as useful for your yard as they are brand new. Using reclaimed materials will often be slightly cheaper if bought, but otherwise these can come from sources like broken down furniture, concrete and brick. These can be used to create pathways, edge and create garden beds. Edging is a technique used by landscapers to add definition to particular sections of your garden. This helps reduce visual clutter, and helps to highlight the sections of your garden that you’re most proud of. Create clear boundaries between pathways and garden beds to add a robust, deliberate and professional touch to any lawn. You can use a number of cost effective materials like recycled bricks, stone bricks or river rocks. It can take a bit of time and some research to learn how to properly trim your plants. Trimming is complicated. Bushes and hedges can grow stubbornly at odd angles. Without regular maintenance (especially when young) and the right cuts, they can look like an eyesore. Professional trimming exists for this reason. Learning to trim your own foliage will help you cut down on the maintenance and labours costs, while giving you complete creative control of your garden. Mulch and compost are vital to maintaining healthy soil, and can be easily produced from the convenience of your own home – all they require are organic materials and food scraps, and a bit of patience. Once processed, mulch is applied to the top layer of the soil to retain warmth and moisture, meaning that you save on utility costs by watering less. Compost will reintroduce vital nutrients to the soil to keep plants growing strong and healthy, saving you from buying expensive fertilisers. Testing your soil’s pH levels will indicate whether there’s a lack of vital minerals necessary for robust plant growth. Plants require a slightly acidic pH soil to grow optimally (as this means that the soil is rich in the right amount of phosphorus and nitrogen. Knowing precisely what’s causing plants to falter will save you from needing to reseed dying plants, and will help you buy the right fertilisers for the job. Illuminating flowerbeds around the veranda could make a world of difference to your garden. Integrating a cheap lighting rig can help to turn a back porch into a welcoming and homely hosting venue, while giving your yard a much needed wow-factor. The benefits of weeding are fairly obvious, as they’re an eyesore and a pest. However, money-conscious homeowners should be wary of weeds because they can invite diseases to your yard and suffocate the fruits and vegetables that you’re trying to grow, completely nullifying your investment. It’s estimated that weeds cost farmers across the country around $2.5 billion dollars annually! Grass clippings and fallen leaves contain many of the essential nutrients and minerals needed for growth; allowing these to decompose on your plant beds or turf (with a bit of processing and shredding) can be a cost effective way to aid your plants growth. Garden pathways accumulate a lot of dirt and grime through years of use, and can look unrecognisable over time. A simple powerwash can give your whole lawn a bit of a facelift, and could be all that’s needed to return the shine back to your lawn. Renting power washing equipment is an inexpensive investment for immediate results. Landscaping experts can offer crucial, cost-saving advice to help you work within your landscaping budget. 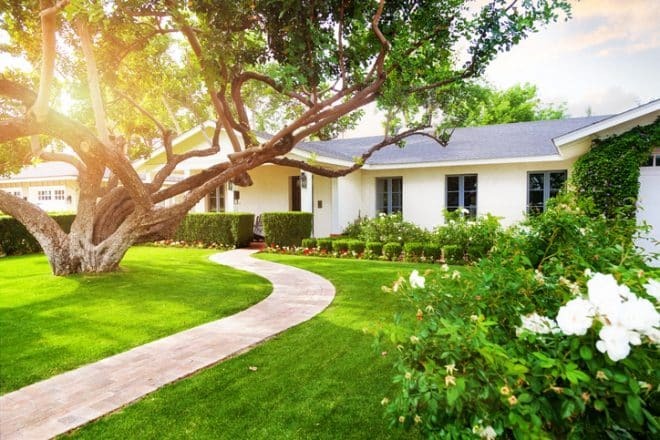 On top of everything else, a consultation with a landscaper should be the first step in any renovation to your lawn to help you avoid costly mistakes, point you in the right direction and help you fully flesh out your vision. To learn more about building a beautiful yard on a budget, contact the experts at Everlast.